While my job is to teach people about history, my vocation as a parent has made me realize that I know next to nothing about how to teach young children about history. 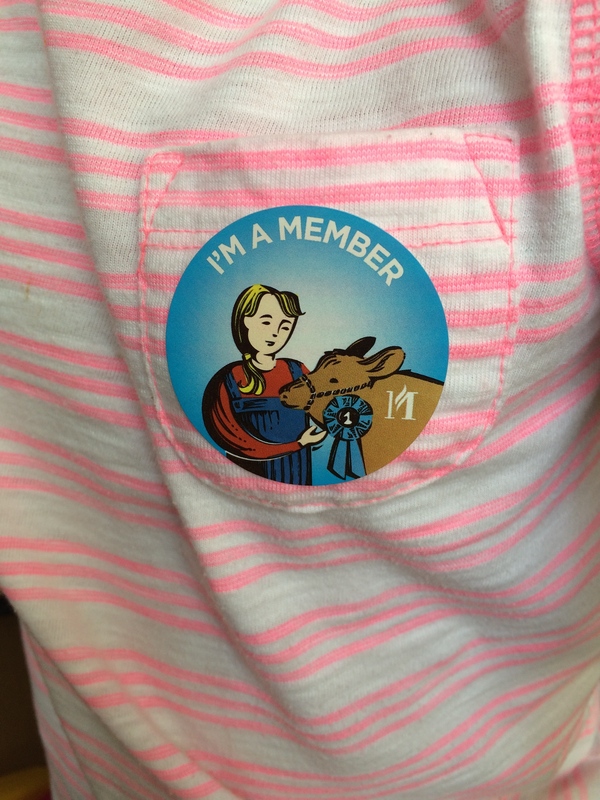 But with our five-year old twins entering kindergarten this fall, I decided to spend this summer trying to understand how children might best learn about the past. Please take the following observations with huge grains of salt — I’m no expert in child development, and I’ve no idea how typical Lena and Isaiah are… But with that said, here are five things I’ve learned about teaching history to five-year olds! There are lots of things I love about living in my home state, but the quality of our historical society is right near the top of that crowded list. For only $75, our entire family gets free admission all year to every MNHS site. Frankly, I would shell out that money if all it bought us was free entry to the Minnesota History Center in St. Paul. But there are twenty-five other sites in the state. 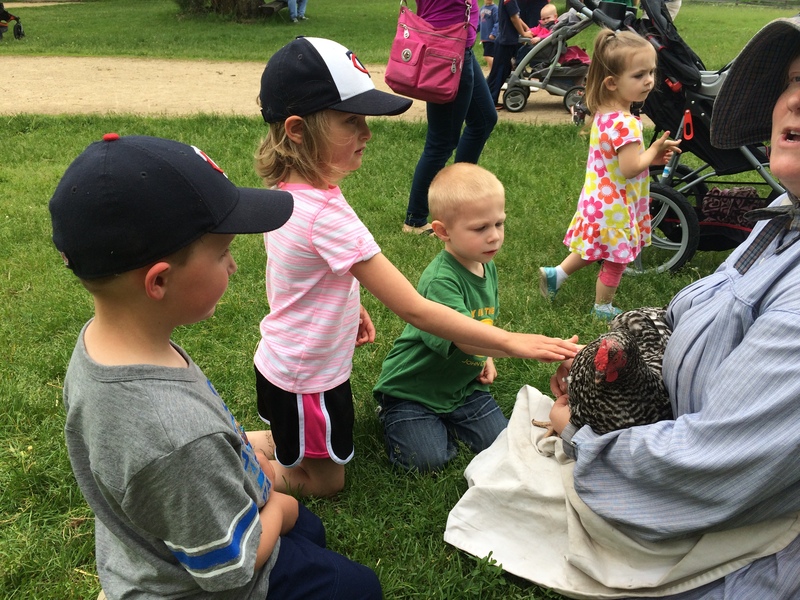 Just in the Twin Cities area that includes Historic Fort Snelling (near the Minneapolis-St. Paul Airport), Mill City Museum (built into an old flour mill in downtown Minneapolis), and the Oliver Kelley Farm (a little slice of the 1860s in the northwest metro). I get the feeling that ours is a better-than-average state historical society, but I’m sure that others offer similar kinds of opportunities for similarly affordable prices. At least in higher ed, I feel like “experiential learning” is one of those good ideas that gets oversold — chiefly by lazy, overgeneralized comparisons to other modes of pedagogy. Not every twenty-year old actually learns well in this way. Grainland: The Minnesota History Center’s version of an indoor playground, Grainland lets kids climb up and down what looks like a grain elevator. To be more precise, they can choose to go the Corn or Soybean path; another exhibit in the same room shows examples of modern-day products made with those two plants. And there’s a pictorial history of agricultural development in Minnesota to keep the grown-ups’ attention. Then Now Wow: Grainland’s actually just one part of a larger area featuring kid-friendly exhibits. Among other activities, Isaiah and Lena like to disassemble and reassemble a bison (learning how the Lakota used each body part) and act as oxen hauling a plow. Water Lab: Speaking of… They also like the play dough in Mill City Museum’s working kitchen — which I enjoy as a baker curious about different types of flour — but Isaiah and Lena love playing around with hydroelectric power in the Water Lab. In particular, they like rebuilding all the mills that once lined the Mississippi River at St. Anthony Falls. Fort Snelling Scavenger Hunt: To be honest, the kids were too tired — and the weather was too hot — for them to last too long in their one attempt at the scavenger hunt at Fort Snelling. But the idea of giving children an incentive (there’s a prize waiting in the fort’s general store) to visit everything from the Dred Scott rooms to the blacksmith’s shop is great. Oh, the fun that’s about to begin! Not pictured: your blogger steering the plow… Is that what you do with a plow? Nothing at these sites is too terrifying (though I’d just as soon the aforementioned scavenger hunt not include a lesson in 19th century dentistry!) but watching the responses of five-year olds has reminded me just how much mundane and extraordinary violence runs through human history. Isaiah is generally bothered by loud noises — we won’t be taking a second trip on the eight-story elevator ride at Mill City, since it recreates a factory explosion that scared the poor boy half to death — so I wasn’t surprised that he didn’t want anything to do with the tornado simulation in the History Center’s exhibit on the history of weather. But anyone would be unnerved by the sound of prairie winds beating against the thin walls of a white settler’s sod cabin in Then Now Wow. Both exhibits remind children (of all ages) that human history is worked out within physical environments that defy our delusions of control and security. 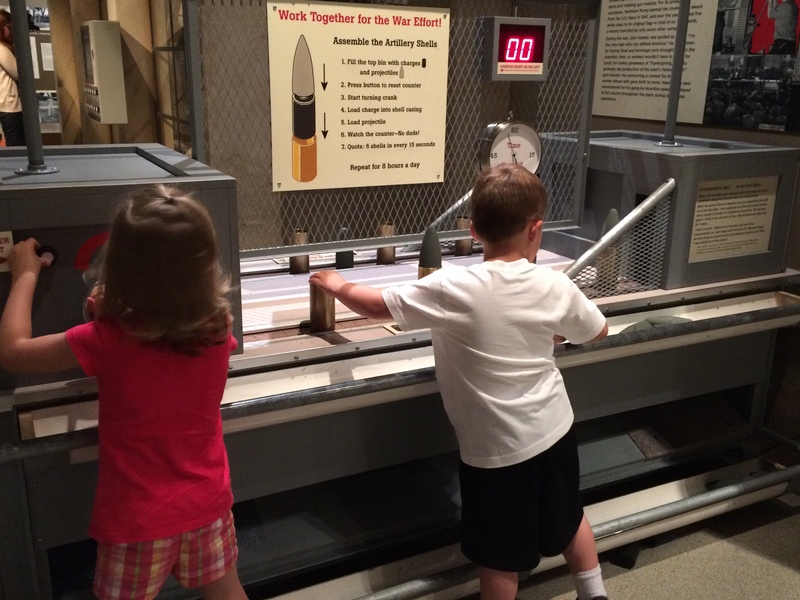 Fortunately, right next to the D-Day simulation is one of the kids’ favorite activities at the History Center: an wartime assembly line that lets them see how many artillery shells they can produce in a minute. Lena would make a great factory manager, especially if her workers were as industrious as her brother. Then it was troubling to see Isaiah in the Then Now Wow streetcar… At each stop on the route, you push a button and a window opens to show a map, photo, or video from the history of part of the Twin Cities. Already a huge baseball fan, Isaiah loved seeing Lexington Park, where his grandfather’s beloved St. Paul Saints played into the 1950s. But at one point there was a crime scene photo from the Prohibition Era, and he’s refused to spend more than two minutes in the street car ever since. I’ve had to be especially cautious with exposure to one of my favorite fields: military history. Thanks to a couple of illustrated Bibles, our children associate soldiers with the Crucifixion, so I knew they’d be leery of the historical interpreters marching around at Fort Snelling. And fear of soldiers plus fear of loud noises made it impossible that Isaiah would enter the plane in the History Center’s acclaimed Greatest Generation exhibit that simulates how paratroopers felt on D-Day! It’s a truism of our discipline that not every engagement with the past is actually “history.” So while I was glad to see our kids enjoy all the activities described above — and they’ve reminded me of the great potential for learning inherent in play — I was also curious to see how they thought about what they were experiencing. Did they demonstrate capacity for any of the “five C’s of historical thinking“? Imaginative play is what makes context, arguably the easiest, yet also, paradoxically, the most difficult of the five C’s to teach. Elementary school assignments that require students to research and wear medieval European clothes or build a California mission from sugar cubes both strive to teach context. The problem with such assignments is that they often blur the lines between reality and make-believe. The picturesque often trumps more banal or more disturbing truths. And I’m not sure that I’ve made much headway in conveying contingency (“the most difficult of the C’s”) or complexity. (Earlier this summer Isaiah came in while I was rewatching part of Ken Burns’ Baseball series, the episode dedicated to Jackie Robinson breaking the color line… I couldn’t begin to explain the complex history of racism in this country, though whatever I said made him decide that the Dodgers are his favorite National League team.) But the other two are well within reach of our five-year olds. This worked best at the Oliver Kelley Farm, which recreates a miniature economy that was largely self-sufficient but also tied in to larger markets. For example, we came across a cart that had wheels with no rubber or metal. “Lena and Isaiah, why do you think they made the wheels out of wood?” It took about five seconds for their eyes to turn to the forest separating the farm from the Mississippi River. 5. Children are capable of historical empathy. The relative absence of change over time — or historical continuity — seems to come naturally to children. At the History Center, Isaiah and Lena enjoy Open House, an exhibit that recreates a small home on the East Side of St. Paul, with each room evoking a different era and a different ethnic group. Their favorite space is the backyard, where games from the childhood of my parents are instantly recognizable to their grandchildren. Their next favorite part of the house is the post-WWII bedroom: they can put oversized coins in a giant piggy bank. Each coin represents the price at the time for ordinary household items. Money doesn’t play a big role in the world of a five-year old, but they have some sense that the numbers are oddly low — that the items are familiar, but their cost has changed significantly over time. What Are the Best History Podcasts? We’ve been to the Kelley Farm many times and the pump has never failed to entertain all four of our children. We’ve also been pleasantly surprised at how interested our older two (ages 9 and 7) are in old gravestones, including the one at the Kelley Farm. This has led to some great conversations about changes in life expectancy, child mortality, vaccines, and family size over the past two centuries.